Xuzhou Huihe international mainly engaged in research and development, design, manufacturing, market and trading of all kinds of high quality glass packaging. As a professional and the front runner in China's glassware industry, we've been working on 13 series of glass articles with thousands of types, such as glass jars, wine bottles, beverage bottles, cosmetic bottles, perfume bottles, nail polish oil bottles, spice bottles, decorative bottles, glass bowls, caps and labels and other related products etc. Huihe has assembly lines and the annual production output is up to 350 million pieces . We have 6 deep-processing workshops which are able to offer frosting, logo printing, spray printing, screen printing, engraving, polishing, cutting to realize "one- stop shop" services for you. Our products have been certified by SGS ,RoHS, CE, ISO etc. and enjoyed great popularity in the world market. Our products have been distributed to over 30 different countries and regions, such as the USA, Australia, Hong Kong, Europe, Southeast Asia, the Middle East and so on. Customer satisfaction, high quality products and convenient service are our company's missions. With our dynamic and experienced team, we believe our service is able to assist your business to grow up continuously together with us. What is the glass quality of your bottles? We work with a variety of vendors who proved a range of glass quality options. Average flint glass has a slight grey or greenish tint to it. This is the most common type of translucent glass. Higher quality flint glass has better clarity, but is more expensive as a result. Ultra premium "super flint" has the highest quality and clarity, and is thus the most expensive, but super flint is the standard glass from which bottles for premium spirits, particularly vodka, are made. Do the bottles need to be cleaned before filling? Yes. Although we often pack bottles upside down to reduce the possibility of contaminants getting inside the bottles, we advise that clients clean the bottles prior to filling. Can Fusion sterilize the bottles before shipment? No. Unless they are well sealed, there is no way to guarantee that the bottles would remain sterile during transit. If sterilization is required, it is better to do it near or at the bottling facility, just before filling. Is there breakage during shipment? Given the inherently fragile nature of glass, there will almost certainly be breakage during transit, but it is usually minimal (losses of less than 1%). Fusion is not responsible for breakage unless it is due to gross negligence on our part. How are the bottles packed? Generally, bottles are either packed in reusable cardboard boxes with dividers, or they are packed in bulk on cardboard trays on pallets. Packing in boxes gives added protection to bottles during transit, and is often better for bottles that we ship prelabeled. We can offer varying degrees of cardboard quality and can have the boxes custom printed with a client's corporate or product-specific branding. Customers frequently choose this option, because it allows them to reuse the shipping boxes for the sale of their product. The cost of a box depends on the overall size, the quality of the cardboard, the number of colors required for printing, and the size of the area to be printed. Bulk packing helps bring down the unit shipping cost by allowing a greater number of bottles to be packed in a single container. Fusion offers a wide range of closures: metal screw cap (ROPP and stelvin), plastic screw cap, cork (synthetic or natural), etc. We can source just about any kind of closure you might need, and we can offer a range of tamper evidence functionalities. How long does it take to get the first order (for a custom-tailored bottle)? 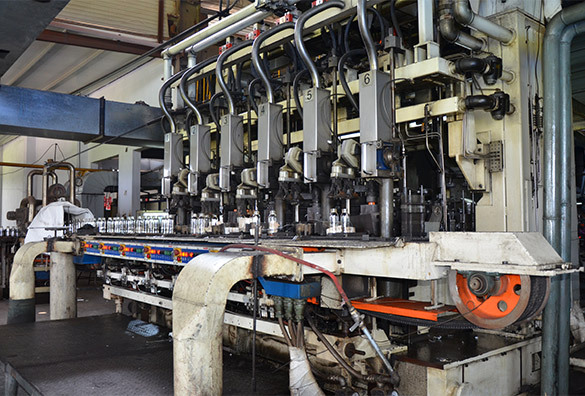 You can expect to receive your first container of bottles in 1-2 months provided that the process goes smoothly. How much does a set of production molds cost? It depends on the design of the bottle. The greater the size and complexity of form, the greater will be the cost to produce the mold. For custom-tailored bottles, the required minimum order is one full 40-foot high cube container The actual quantity per container will depend on the size of the bottle and how it is packed. That said, if you are interested in a standard stock bottle, it is possible that we may have something in inventory that we are willing to sell in smaller quantities. For special order, we can discuss the MOQ. Is it possible to order custom bottle samples? We can make samples, but to do so requires an investment from you to make the sample bottle mold. Unless you plan on purchasing large volumes of the bottle in the future, ordering samples alone is not advised.